Hello! I am Joanne Hawker and I currently live in a small corner of Somerset where I drink far too much tea and draw pictures! I graduated from the University of Wales Institute, Cardiff in 2010 and since then I have been working a variety of wonderful freelance projects whilst working full time. I was lucky enough to have a piece of my work in John Lewis, Oxford Street over the summer during the Olympics and took part in project by Pointe Blank, which saw my work in the Cardiff Design Festival and the Eye Candy Illustration Festival! Recently I took the plunge to open up a Not On The High Street Shop where people can own a little piece of my world! 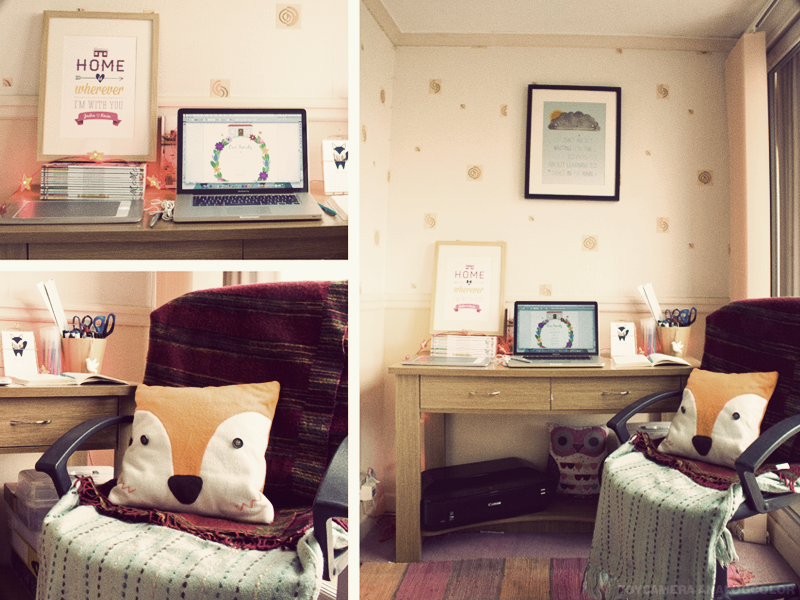 My creative workspace is quite a small one as you can see from my picture. It’s actually in a corner of my mother’s living room and is usually far messier than that! I have my own print above the desk, a copy of which was in the Oxford Street store of John Lewis this summer. 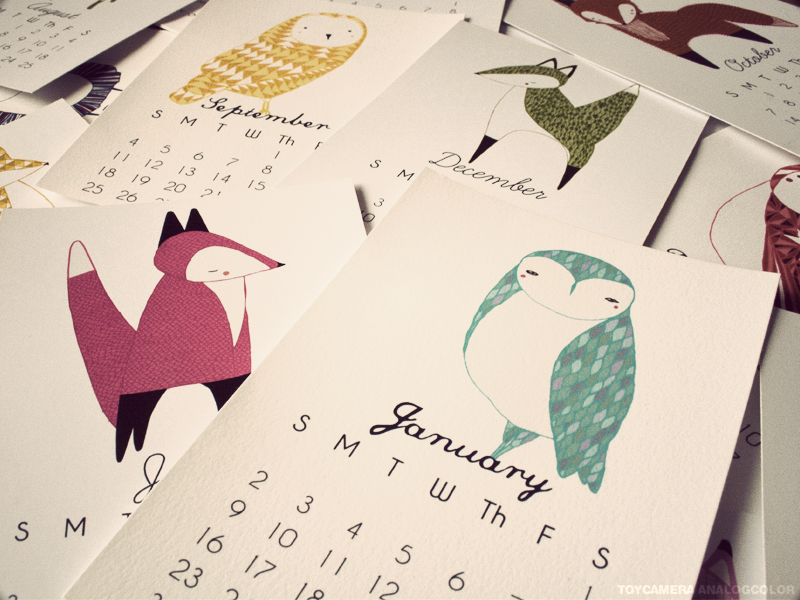 I have my trusty pot of pens, a desk calendar and a huge stack of Mollie Makes. The drawers are full up with sketchbooks, more pens and various tapes. You can also see my new toy! A Canon printer for printing my new personalised prints. I also have various boxes of paper, art materials and an owl cushion. My chair is covered in blankets to make it look a little cosier and they are there for when the cold comes in through the door. 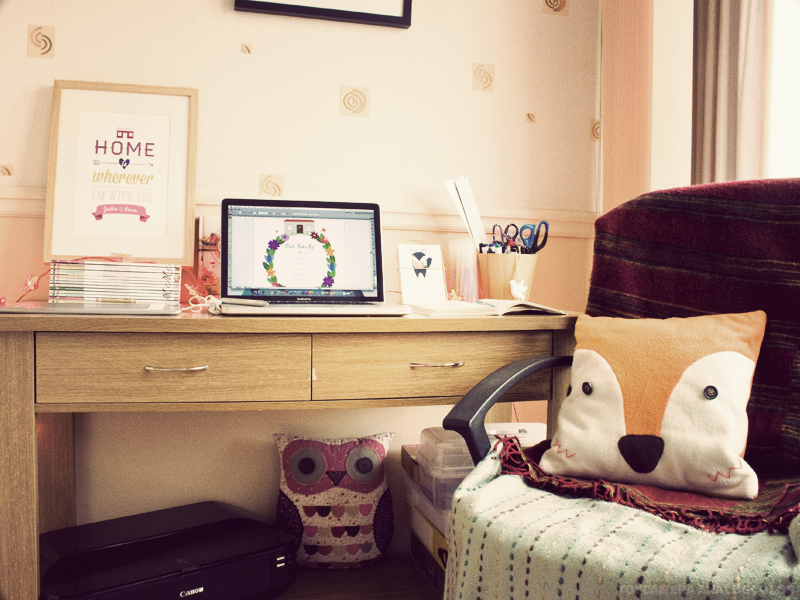 The fox cushion that I made also looks after my space. It’s nice to have a space of my own but it soon gets filled up with rubbish and doesn’t stay tidy for long. Before you know it I’ve taken over most of the living room! Ok so now I’ll you a bit about the other things that I have photographed. Pens: I have quite a lot of pens and these are a very small few. 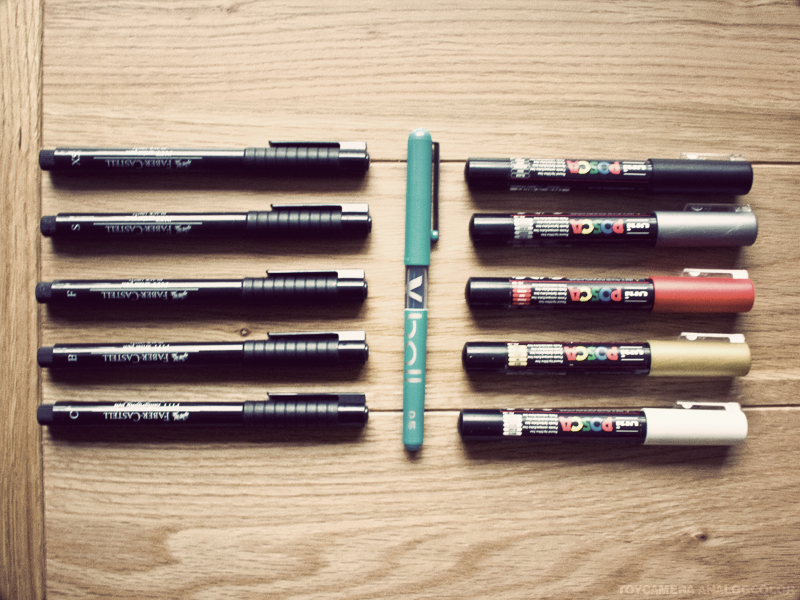 I like to have a variety of fine liners, roller balls and poscas. I also have a thing about a red biro right now. No idea why as it’s a really cheap pen and I’ve broken it which is why its not in the photo! As I mentioned before the draw in my desk is where I stash my sketchbooks. You’ll notice from the photo that everything appears black and white. It’s very rare that you find illustrations that are full colour. At the same time its not very often you will find a neat finished drawing. 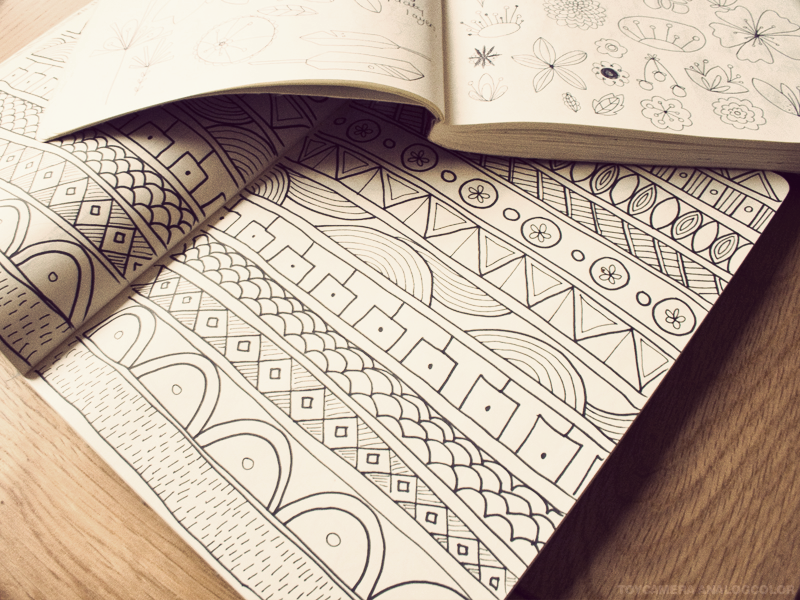 I mainly use the sketchbooks for scribbling. Some of it is VERY rough. It only gets neatened up when it’s put into the computer. Then I draw it all over digitally using my pen tablet. Diary: I have a confession to make about diaries. Last year I had the most beautifully illustrated diary. The sort that you don’t want to ruin by scribbling in. Anyway, I wrote in all my details, birthdays and addresses and had the best intentions of using it. Needless to say I completely forgot about it and didn’t use it all! This Christmas my younger sister bought me this owl diary. I have good intentions to use it and have started scribbling things in. Lets start a wager. How long until I forget about it and don’t use it? This is my little collection of Ammo Magazines. I also have the other limited editions they have done. I love these magazines. 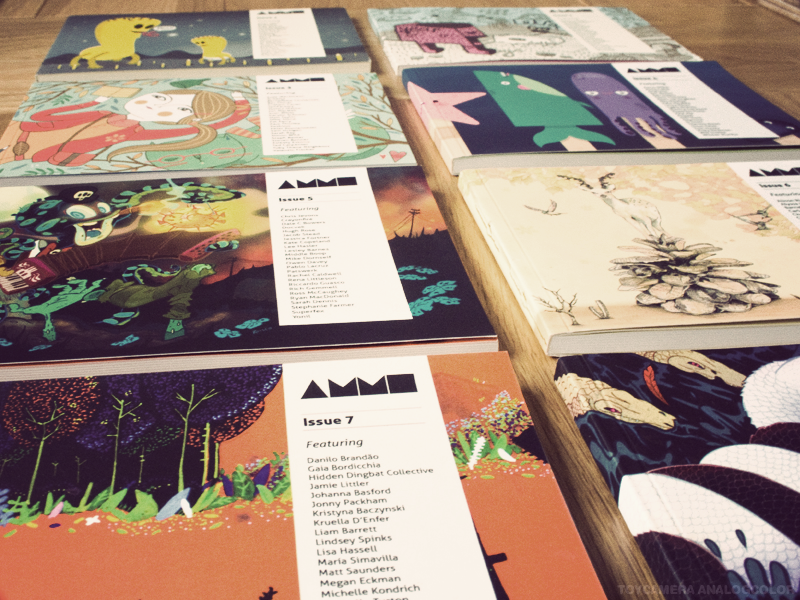 They are so small but contain wonderful illustrations and great interviews. One day I hope to be good enough to be considered to be a part of it. 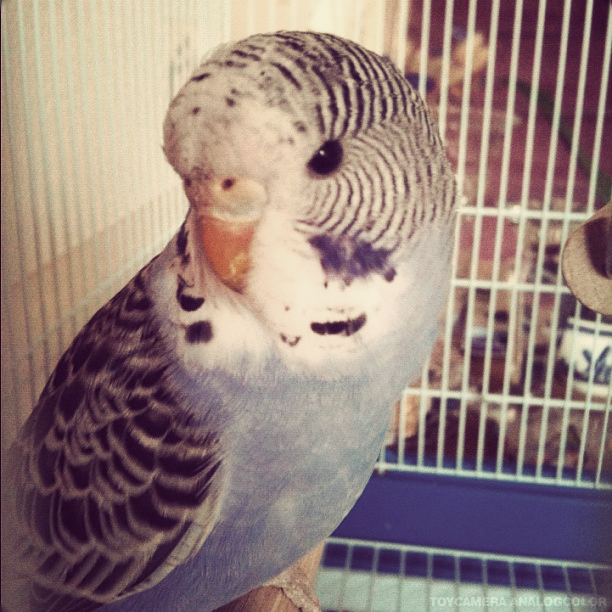 This is my insane budgie Bobo. He keeps me company when I’m designing and generally losing the plot when my laptop gets the spinning wheel of doom! He seems to have a thing about The Lion King Soundtrack and squawks like mad when he hears it! He also likes to chew on my finger, sometimes he can be quite vicious about it but its all ok. It doesn’t really. My desk is usually a massive mess so I just sit on my sofa and scribble. I’ll move to the table when I get my pen tablet out though. I’d love to have a bigger space, a larger desk and lots of storage. I’d also plaster the walls in inspiring images and other lovely things. However, I’m not allowed to do that because my space is in my mother’s living room and she wouldn’t appreciate me re-wallpapering her walls! What’s your favourite part of your space? It’s not too far from the kitchen! So I can make as many cups of tea as I like with minimal effort. And the fact it’s near the conservatory doors so I can look out into the garden if I want to. Is your space always evolving? My space is a vicious circle of mess – tidy, tidy-mess, mess-tidy etc etc. It’s a losing battle. It also tends to sprawl a bit. Might have to put a stop to that soon. No, not as much as I would like it too. If I could do all of the things I stated in the ‘make it more inspiring’ section then I think it would. I can’t wait to have my own house then I can go mad on decorating and make it a little more ‘me’. Is having your own space important to your creative process? The space isn’t really that important in the creative process. I can draw anywhere. Everything starts with a basic idea. Either a song lyric gets stuck in my head or I see something and make a quick scribble. Then later on I’ll go back to my book and see what I’ve made and something will jump out and I’ll develop it from there. I’ll draw it up a little bit neater and then I’ll whip out my wacom bamboo pen tablet and draw it into my laptop. Once its there I play around with it until I’m happy and then I reveal it to the world! I can do that in my living room, at my boyfriends or even on a train if I had to. I don’t as the surface is not that great and the natural light isn’t really in the right place. When I photograph my prints for my shop I pop over the road to my nan’s house and use her back bedroom where the natural light is almost perfect. She also has a lovely wooden dresser with magnolia painted walls. This means that I can change the wall colour to what ever I want! At the moment I mainly create prints to go into my shop but I’m looking into new products that I can create. I also do freelance design work, which is good fun and keeps me busy. My work could be described as something for the young or for those who are young at heart. I love, love, love to design for children and some of my newest prints are suitable for a young child’s bedroom/nursery. I have also recently been experimenting with typography as it was something that I was never really good at so it’s good to practice at your weaknesses! Out of that I managed to create a few prints that I am really happy with. My work is designed to make you smile, feel good and mostly importantly for you to enjoy. 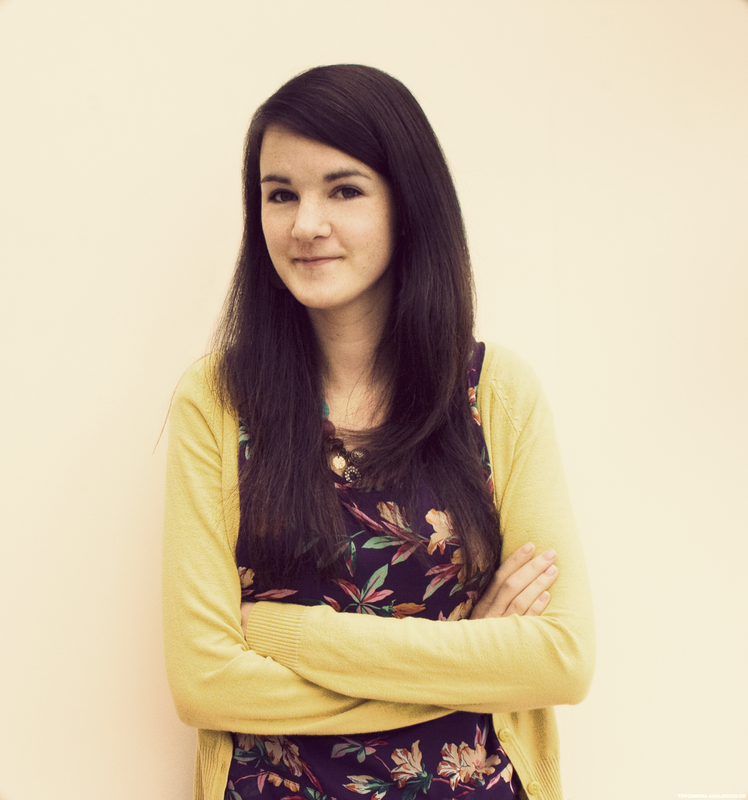 Quirky, Passionate, Enthusiastic, Designer and Tea Pot. You can find Joanne work all over the internet, Not on the high street you can find wonderful creations, also Joanne has a lovely etsy shop, you can also find Joanna across all social networking sites, facebook, twitter she also has a portfolio available to view. I hope you have enjoyed my second Instalment of give me space, I am a massive fan of Joanne’s creations, I hope you enjoy them as much as I do. I love her cosy space perfect for being creative in. Enjoy! yay i love joannas work! so lovely to see peoples spaces. loving those patterns too. This is such a lovely feature 🙂 I think creative spaces can be important, but like Joanne said, creativity can happen anywhere and you can't wait until everything is perfect, otherwise you'll never get started!